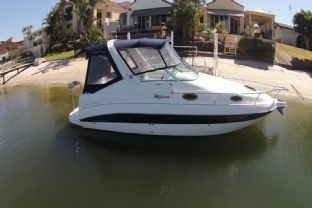 ***Massive Price Reduction*** Owner moving and must sell 1989 Model Bayliner 2955. New Fridge, Electric Anchor, full covers, metho Stove, gas detector, Water tank, bilge pump, safety gear, GPS/Sounder - Lowrance, Galv Ramp Trailer, SS rear rail & BBQ, rod holders, Twin deep cycle house batteries + start battery, LED lighting, remote spot light, solar panel, 240V conversion, full headroom, new electric toilet & holding tank, 2.4m zodiac dingy, Twin 5.8lt OMC Cobra's with New SS Manifolds, power this boat along at a comfortable cruising speed of 25 knots. Enough accommodation for a family of 6 and all the comforts required for weekend or a short break. 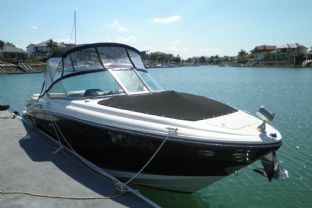 This boat has the lot, which allows you to sit back relax and enjoy boating. 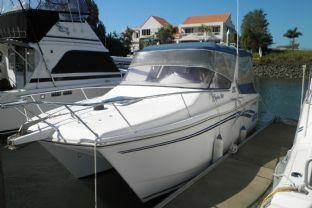 Popular first time flybridge cruiser, the Bayliner 2556 Command Bridge is ideal for our Gold Coast waters. Powered by a Mercruiser 7.4 Litre MPI V8 done a low 275 hours she cruises at 20 knots and tops out around 28. Accommodations for four in a v berth fwd and a separate mid cabin double. Vessel has just had its annual engine service and extensive service history. Inspection will not disappoint on this immaculate vessel. 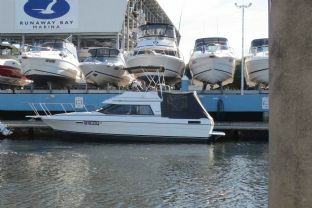 At this price she won't last long, call owners central agent Action Boating today 07 5564 1995. Every care is taken when compiling this information; however we take no responsibility as to its accuracy. Prospective Purchasers should satisfy themselves as to the accuracy of this information by their own inspection, or engage a Marine Surveyor. 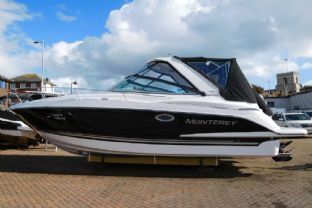 NOW REDUCED This 2006 Bayliner 285 is what everyone is looking for, with her elegant lines, spacious accommodation and her luxurious interior decor pack combined with her comprehensive specification and the powerful Mercruiser 6.2 Litre 320HP V8 MPI engine. 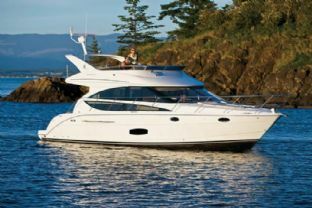 The Bayliner 285 comes equipped for total comfort, with a full-featured galley and a convenient head, plus two double berths and a dinette. Add a healthy sense of adventure, and you’ve got everything you need for days (and nights) of fun on the water. 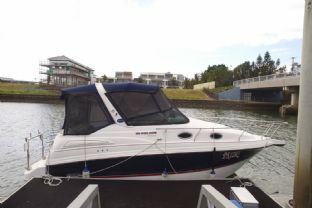 The Bayliner 285 Cruiser is a good choice for taking the family on a long weekend or an extended trip around the coastline wherever you may be. She has the room to stay comfortable topside and below as well as all the amenities to stay comfortable overnight aboard. 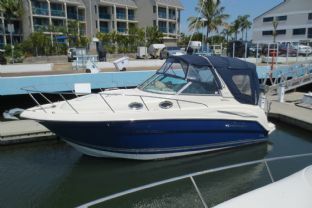 This model has both the performance, economy and the features to give you a lifetime of pleasure entertaining your friends and family on the water. Six passengers sleep comfortably in the 285’s spacious cabin, thanks to a private mid-berth, a convertible dinette and a roomy forward double berth. Serve meals at the dinette or opt for meals on deck with the 285’s adjustable cockpit seating and large removable aft table. Every care is taken when compiling this information; however we take no responsibility as to its accuracy. Prospective Purchasers should satisfy themselves as to the accuracy of this information by their own inspection, or engage a Marine Surveyor. This entry level luxury cruiser is a Batliner 245 2007 model on a trailer. 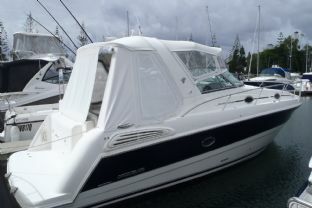 The vessel is in good condition with a 5.0 MPI Litre V8 Mercruiser with 260HP. 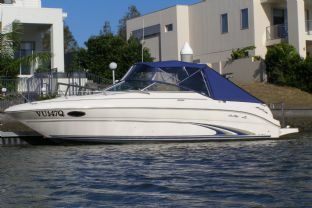 The 245 Ciera sleeps four in comfort in a convertible V berth forward and a double in the mid cabin. The galley is equipped with a microwave oven, a spirit/electric stove, hot & cold pressure water, a refrigerator and a deep bowl stainless steel sink completes the galley. Entertainment is taken care of by an AM/FM/CD marine stereo. In the cockpit there is seating for six in comfort. The helm features a GPS and sounder by Simrad and complete instrumentation. 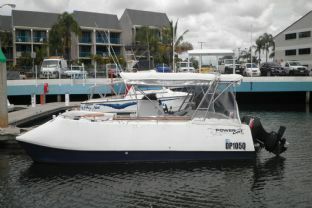 The canvas package consists of a bimini and clears. Vessel is on a trailer and priced to sell today. 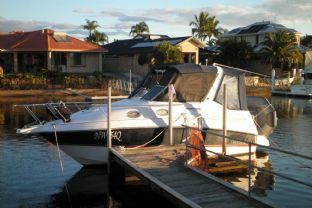 Call today for an inspection, Action Boating 07 5564 1995. Is your current boat or trailer due for a Service? or in need of repair? dont let it cost you extra money! service or repair it now call now for a booking date. We come to you. 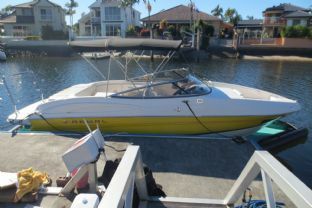 Action Boating lists all details of this vessel in good faith as provided by the owner, but cannot GUARANTEE or WARRANT the accuracy of this information or the condition of the vessel. Inventory inclusions are subject to change or deletion without notice prior to sale. We recommend that purchasers employ an independent marine surveyor & mechanic to determine the fitness and suitability for the boats intended usage. 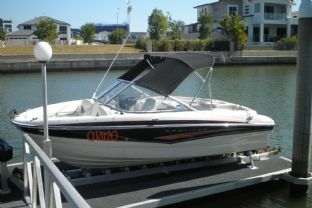 NOW REDUCED 2005 BAYLINER 215 BOWRIDER on a dual axle trailer is the perfect broadwater and sports boat. 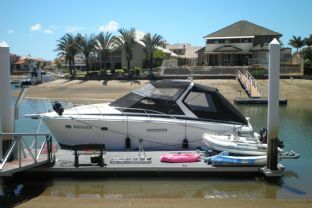 The roomy cockpit features an alloy waketower, back to back seating that convert to individual sun lounges. The clever aft seating configuration also adapts to make two bucket seats or a single sun lounge. Listen to your favourite songs on the Kenwood sound system. The helm features a GPS and depth sounder and Bayliner gauge cluster. 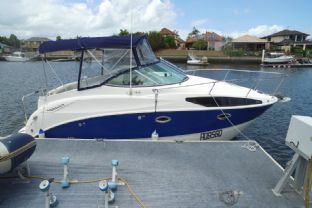 This turn-key vessel is ideal for watersports and cruising and it is powered by a freshly serviced MERCRUISER 5.0 MPI V8 260 HP STERNDRIVE with 154 hours. 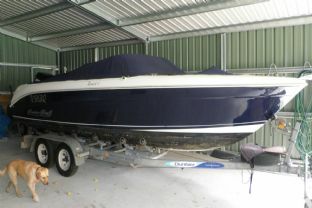 This boat is in GREAT CONDITION and well worth a look. Call the team at Action Boating Today!! (07) 5564 1995 Is your current boat or trailer due for a Service? or in need of repair? dont let it cost you extra money! service or repair it now call now for a booking date. We come to you. Every care is taken when compiling this information; however we take no responsibility as to its accuracy. Prospective Purchasers should satisfy themselves as to the accuracy of this information by their own inspection, or engage a Marine Surveyor. 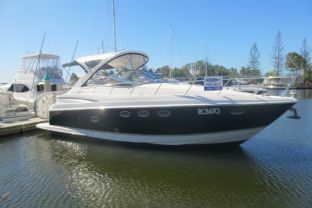 This well presented vessel is ready for family boating with plenty of room for all. 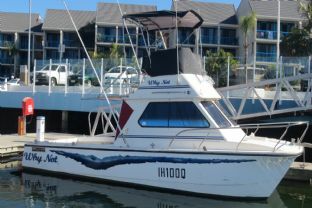 The large cockpit is great for relaxing or serious fishing, the saloon is light and bright and the kitchen area has plenty of bench space and good refrigeration. Powered by twin 475Hp diesels for a comfortable 20 knot cruise or wide open at 24 knots when asked. Onboard power is provided by an Onan generator. 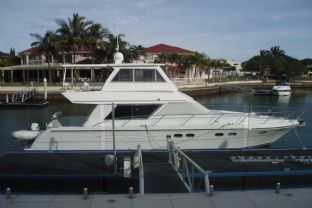 The flybridge is equipped with a hardtop and near new clears and she has a rear cockpit awning. The dinghy cradle and davit is located on the foredeck. This vessel looks great and represents great value for money in a hard to find vessel. Is your current boat or trailer due for a Service? or in need of repair? dont let it cost you extra money! service or repair it now call now for a booking date. We come to you. Every care is taken when compiling this information; however we take no responsibility as to its accuracy. Prospective Purchasers should satisfy themselves as to the accuracy of this information by their own inspection, or engage a Marine Surveyor. 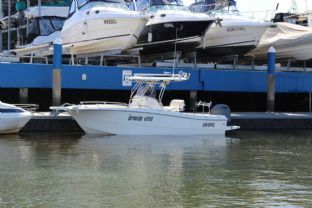 What a great example of these sought after little Game and Sports fishing boats. 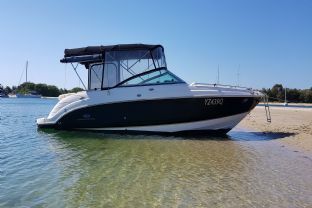 This Blackwatch 26 has a Mercruiser MAG 350 Horizon petrol engine that was installed 3 years ago and is economical with great sea performance. The interior has a V berth forward and a convertible dinette. She has a good sized galley and enough room to sleep 4 comfortably. The cockpit is large and uncluttered for serious fishing. 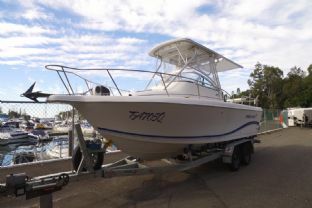 The fly bridge control station with its upgraded helm seat is comfortable and has custom targa with Bimini and clears that are near new, Raymarine GPS and sounder complete electronics package to find those fish. Is your current boat or trailer due for a Service? or in need of repair? dont let it cost you extra money! service or repair it now call now for a booking date. We come to you. Every care is taken when compiling this information; however we take no responsibility as to its accuracy. Prospective Purchasers should satisfy themselves as to the accuracy of this information by their own inspection, or engage a Marine Surveyor. 2001, The 466 has many special features and little touches that set her apart from the pack. The entertainment center comes equipped with TV, VCR, and stereo with CD. The galley is well stocked with a full-sized refrigerator/freezer, three-burner stove with oven, and a convection microwave. Up on the bridge there is comfortable seating and a spacious aft deck with a wet bar that will keep the traffic down and the conversations intact. The 466 sleeps six but it can accommodate eight. You can only truly get the flavor of a Carver once you've stepped inside one. They definitely have the space if that's what you're looking for. There's nice flow on this boat. Once you step aboard the 466 you'll notice it has a nice overall flow inside. The salon is uncluttered and open, giving you more room to entertain or simply relax. The 466 offers elegant accommodations. The master stateroom aboard the 466 is more like a bedroom. It features cherrywood drawers and lockers. Guest Stateroom, The forward guest stateroom has an island-style berth, good storage, cedar lined lockers. 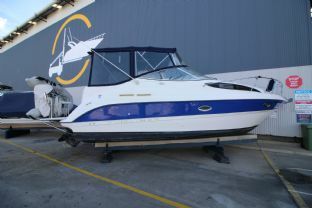 Repowered in 2007 with twin 5.0 MPI V8 260 HP Mercruisers done approx 190 hours. 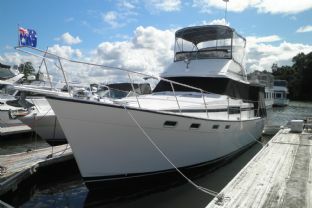 The Carver 28 Flybridge Cruiser remains one of the more popular family cruisers ever built. Carvers are well known for their spacious floorplans, and this Carver 28 is no exception. The salon features seating for a small crowd, the head is surprisingly large, and the cockpit is roomy enough to handle a couple of deck chairs or light tackle anglers. The flybridge is huge with seating for six. Vessel also has a genset and airconditioning and a bowthruster. 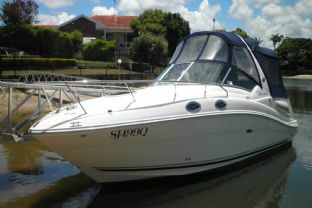 This is a great family boat and is worth an inspection. Is your current boat or trailer due for a Service? or in need of repair? dont let it cost you extra money! service or repair it now call now for a booking date. We come to you. Every care is taken when compiling this information; however we take no responsibility as to its accuracy. Prospective Purchasers should satisfy themselves as to the accuracy of this information by their own inspection, or engage a Marine Surveyor. 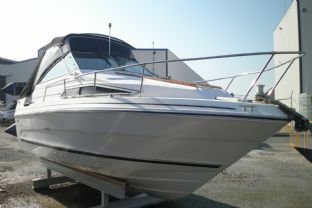 COBALT 263 CUDDY CABIN CRUISER!! 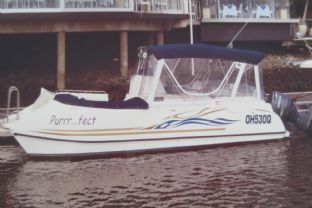 This vessel features a social cockpit with aft bench seat, plenty of cup holders, clip in/out carpets, a sun lounge on the port side and an ergonomic helms seat. The helm features a LOWRANCE DEPTHSOUNDER, soft grip steering wheel, helm mounted compass and two way radio. Downstairs features a clever layout with a midship cabin that can comfortable accommodate two, a forward convertible V berth and dinette can also accommodate another two. The saloon has a galley equipped with a single burner cooktop, deep bowl sink and ice box. A fully moulded head compartment with electric flush toilet and shower is also located below. This vessel is powered by a MERCRUISER V8 THUNDERBOLT IGNITION STERNDRIVE. Also included is a near new bimini covers and clears. CALL ACTION BOATING on 07 5564 1995 TODAY FOR AN INSPECTION!! Is your current boat or trailer due for a Service? or in need of repair? dont let it cost you extra money! service or repair it now call now for a booking date. We come to you. 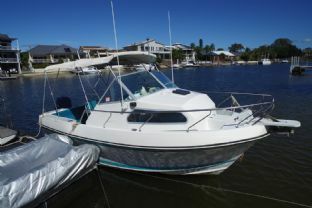 Action Boating lists all details of this vessel in good faith as provided by the owner, but cannot GUARANTEE or WARRANT the accuracy of this information or the condition of the vessel. Inventory inclusions are subject to change or deletion without notice prior to sale. We recommend that purchasers employ an independent marine surveyor & mechanic to determine the fitness and suitability for the boats intended usage. 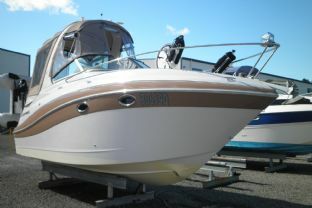 The versatility of CruiseCraft’s Resort 55 bow rider makes it a popular choice for water sports families. Roomy,stable, mild mannered and an exceptional performer that is the delight of boating aficionados, the Resort 55 can be seen on waterways virtually everywhere in Australia. Lavish upholstery, carpeted floor, a bow compartment that invites passengers, big broad rear lounge and a plethora of storage space … the CruiseCraft designers certainly hit the sweet spot with the Resort 55. With the 175 hp outboard, the Resort 55 is quick to plane and tows skiers effortlessly with the stainless steel Ski pole. 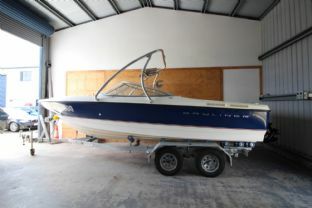 Legendary performance and style in this 2003 model resort 6 bowrider. Powered by a Mercury 200 HP EFI Saltwater series with low hours. 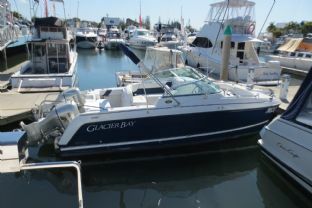 Ideal for skiing, cruising or fishing. 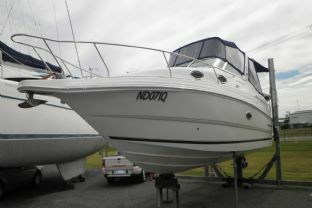 Inclusions are as follows...Navman fishfinder, marine stereo, carpets, bimini, bow and cockpit covers, ski pole, dual axle trailer with spare wheel and cockpit table. Vessel has been kept under cover for most of its life and is in good condition. 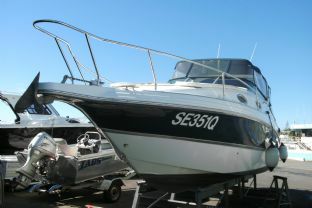 Please call Action Boating today for more details or inspection. Every care is taken when compiling this information; however we take no responsibility as to its accuracy. Prospective Purchasers should satisfy themselves as to the accuracy of this information by their own inspection, or engage a Marine Surveyor. HUGE PRICE REDUCTION The Targa 48 epitomises the lifestyle, quality and performance that is to be found only in a true Mediterranean-style sportscruiser. This boat provides quality and class wherever you care to look. We could rave on about the quality of the interior joinery and how that quality doesn't stop at the doors or hatches; or the sophistication of the high gloss finish that is rarely found in residential or other building work, let alone out on the water. But suffice to say no stone is left unturned in the pursuit of quality. There is every necessary convenience, and more. The berths are very generous and well appointed, with abundant storage and hanging lockers and adequate privacy for all passengers. A 24,000 BTU air-conditioning system maintains a comfortable temperature below deck. This boat is so very smooth and quiet when underway and there is little to reveal that its massive twin power source is diesel not petrol. At cruise speeds the Targa is efficiently smooth and quiet and will skim effortlessly over the seas without the slightest hesitation and with the driest and most comfortable of rides you would expect. In fact, this boat cruises so easily and smoothly you need to check the GPS to reassure yourself just how fast you are actually going. 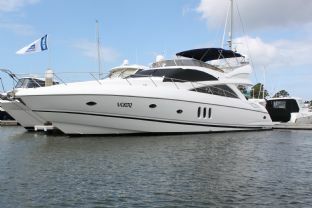 When you step aboard this beautifully appointed Four Winns 348 Vista all your troubles seem to just drift away. 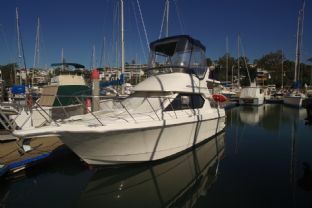 This stunning fully fitted out vessel has all the comforts of home from the reverse cycle air conditioning to the extra fridge in the cockpit, your time out on the water will always be relaxing. This vessel has just been antifouled and legs and generator serviced. Berths five comfortably in two doubles and a single. Get in quick this boat won't hang around for long. Call owners central agent Action Boating. Is your current boat or trailer due for a Service? or in need of repair? dont let it cost you extra money! service or repair it now call now for a booking date. We come to you. Every care is taken when compiling this information; however we take no responsibility as to its accuracy. Prospective Purchasers should satisfy themselves as to the accuracy of this information by their own inspection, or engage a Marine Surveyor. This IMMACULATE Holden Commodore Omega would Make an Ideal First Car! Well Maintained with a service book and Well Presented with Alloy Wheels that give this Commodore a Neat Looking Stance! 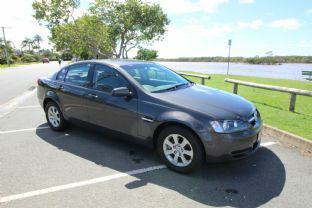 This Excellent Example of a Holden Commodore is Finished in Grey metallic with Grey Cloth Trim. It Features a 3.6 Litre 6 Cylinder Engine with an Automatic Transmission. ... Key Features of This Vehicle Include ... ABS BRAKES DUAL AIRBAGS ELECTRONIC STABILITY AND TRACTION CONTROL ENGINE IMMOBILISER ELECTRIC WINDOWS CENTRAL LOCKING AIR CONDITIONING CD PLAYER WITH AUX SUPPORT MULTI FUNCTION STEERING WHEEL CRUISE CONTROL GENUINE ALLOY WHEELS GREAT SERVICE HISTORY Our professional and trustworthy staff will help you drive away in the vehicle of your dreams. Whether they’ve been looking for something late model or affordable, we’ve helped all of our Gold Coast customers find exactly the vehicle they needed. With our varied inventory, different purchase and leasing options, and multiple financing plans, you’re all but guaranteed to drive off with a great purchase. 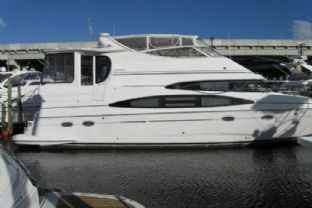 ***Huge Price Reduction*** Owner wants it gone moving interstate 1996 HORIZON 50 FLYBRIDGE MOTOR YACHT. 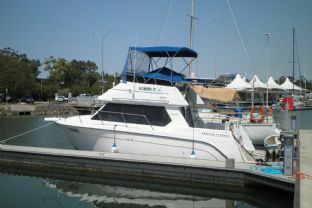 COMPLETE KEEL TO NEW FIBREGLASS FLYBRIDGE IN 2009 AT A COST OF $550,000.00.A BEAUTIFULLY MAINTAINED PRIVATE CRUISER WITH A 2 CABIN LAYOUT. MASTER WITH QUEEN SIZE ISLAND BED AND OWN ENSUITE AND SECOND CABIN WITH DOUBLE BED AND OWN ENSUITE. 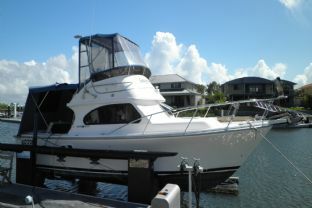 FULLY AIR CONDITIONED INTERIOR AND ALSO FLYBRIDGE. BURLED MABLE INTERIOR WITH FLAT SCREEN POP UP TV AND DVD. GALLEY HAS FULL SIZE FRIDGE, MICROWAVE, OVEN WITH HOT PLATES, FILTERED WATER AND NEW STAINLESS STEEL 50 LTR HOT WATER. 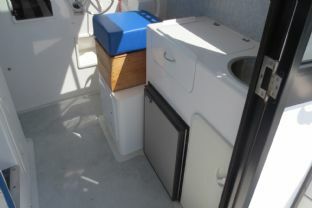 TWO EXTRA FRIDGES ONE IN SALOON AND THE OTHER ON THE FLYBRIDGE, NEW FOAM CUSHIONS AND COVERS. FLYBRIDGE HAS ELECTRONIC CONTROLS WITH SEPARATE DOCKING STATION, ALL NEW GAUGES, WIPERS, AUTO PILOT, DEPTH SOUNDER, GPS, VHF RADIO, REMOTE ANCHOR WINCH CONTROLS, SURROUND SOUND SYSTEM AND 45 INCH DIAMETER SATTELITE DISH, ONE FRIDGE. FLYBRIDGE IS COMPLETELY SOUND PROOF. 8KVA KOHLER GENERATOR. NEW 350KG DAVCO DAVIT ON STERN WITH COVER AND NEW 3.3M FORCE INFLATABLE WITH NEW COVER FITTED WITH A 9HP MERCURY OUTBOARD. 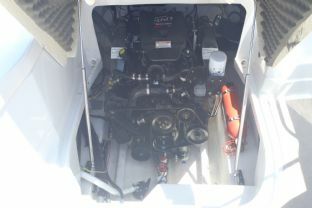 TWIN 435HP CATERPILLAR ENGINES WITH LOW HOURS AND IMPECCABLY MAINTAINED. 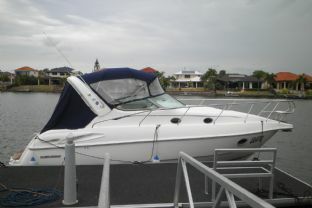 BOAT HAS A TOP SPEED OF 20 KNOTS AND CRUISES COMFORTABLY AT 15 KNOTS. FUEL CAPACITY IS 2,500 LTRS AND FRESH WATER IS 1500LTRS. BOW THRUSTER AND NEW BATTERIE THROUGHOUT. VANITIES HAVE FRESH WATER SILENT TOILET SYSTEM. NEW S/S ANCHOR WITH CHAIN AND 2 FRESH WATER GURNEY OUTLETS. BOW AND STERN. BOAT HAS FLY SCREENS ALL ROUND WITH EXTERNAL COVERS. MAJOR WORK CARRIED OUT INCLUDED COMPLETE HULL PEEL THEN FIBREGLASSED. HULL WAS THEN REPAINTED AS WAS THE COMPLETE NEW FIBREGLASS FLYBRIDGE. 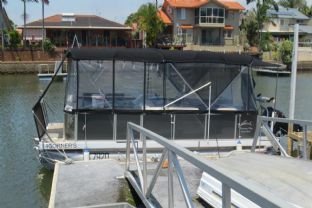 This Awesome 45 foot House Boat has just had a major make over by none other than the team at Foxtel's Selling Houses Australia! 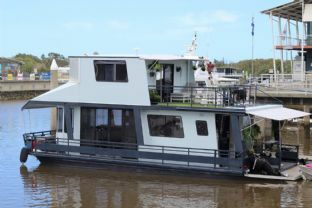 Designed and overseen by Shaynna Blaze and Charlie Albone this stunning house boat has the lot. From the brand the new kitchen with new appliances and Silestone bench tops, all new flooring, ceilings, walls, lighting and Thermal Honeycomb Blinds. All the electrical and Gas systems were redone and both have a certificate of compliance. The twin Mercury 50HP outboards were fully serviced and the vessel has been given a fresh coat of antifoul. 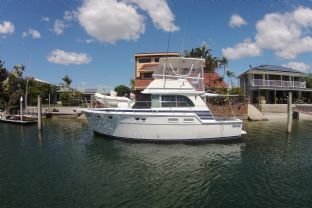 Call owners Central agent NOW as this fully refurbished boat won't last. 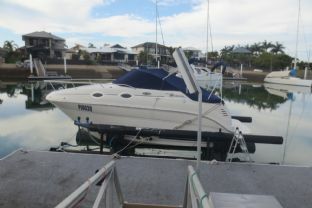 Action Boating lists all details of this vessel in good faith as provided by the owner, but cannot GUARANTEE or WARRANT the accuracy of this information or the condition of the vessel. Inventory inclusions are subject to change or deletion without notice prior to sale. We recommend that purchasers employ an independent marine surveyor & mechanic to determine the fitness and suitability for the boats intended usage. 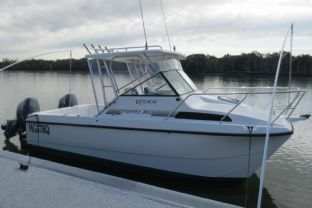 This 2007 Kevlacat 3000 Express Cruiser is fully equipped and ready to go for you next fishing adventure. The boat has just been serviced, anti-fouled and detailed ready for the season. 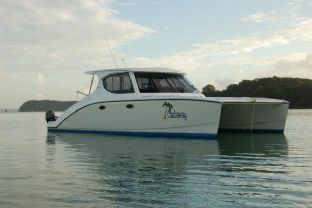 The smooth ride and sea handling capabilities is synonymous with the legendary Kevlacat range and it is capable of handling just about any bar in Australia. With the full compliment of Furuno electronics including GPS, radar, autopilot and sounder, catching the big one will be a piece of cake. The Twin Suzuki 250HP engines deliver an economical and quiet 30 plus knots of speed coupled with 720 litre tanks you can get out to those good spots. It is well worth a look, call owners Central Agent, Action Boating for full specs on 07 5564 1995 Is your current boat or trailer due for a Service? or in need of repair? dont let it cost you extra money! service or repair it now call now for a booking date. We come to you. Every care is taken when compiling this information; however we take no responsibility as to its accuracy. Prospective Purchasers should satisfy themselves as to the accuracy of this information by their own inspection, or engage a Marine Surveyor. OWNER SLASHED PRICE!! This 2005 LARSON CABRIO 370 has LOW HOURS. With a beautiful white hull and extended swim platform with stainless steel rail and BBQ. From the first step aboard this great vessel you notice the HUGE SOCIAL COCKPIT. Features comfortable U shape seating with a table, sun lounge, 12 volt fridge, wet bar and even a ELECTRIC HELM SEAT! 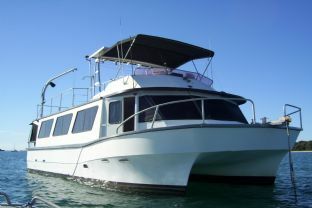 Downstairs also boast volume with a huge midship cabin that converts into a social seating arangement, wrap around couch with a rosewood table, LCD TV with DVD player and seperate forward cabin with huge double bed and seperate LCD TV. The fully equipped galley has a microwave, double burner cooktop, full size fridge/freezer, deep dish sink and loads of storage. The bathroom features a seperate shower and toilet with duel access. This boat is powered by TWIN VOLVO PENTA 8.1 Gi V8 375 HORSEPOWER SHAFTDRIVES. 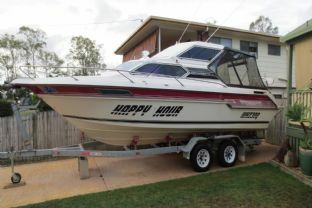 Call Action Boating Today: (07) 5564 1995 Every care is taken when compiling this information; however we take no responsibility as to its accuracy. Prospective Purchasers should satisfy themselves as to the accuracy of this information by their own inspection, or engage a Marine Surveyor. Monterey 282 Sports Cruiser. This vessel is in great condition with low hours on the twin Volvo 4.3 Gxi V6 engines that have the option of Neutrasalt. An Inverter has been fitted to run some of the 240 gear off shore. This vessel sleeps four to six in comfort and has a dinette down in the salon. A set of LED lights on swim platform are great for the night at anchor. A stainless Rail with bracing bracket and two sets of mounts for an optional BBQ (not supplied) and baitboard & 4 rod holders. Navigation supplied is a 7200 Navman VHF and 6500 Trackfish with thru hull transducer, PLUS a Bowthruster, Radar,Many more non standard options. Hurry this wont last!!!!!. Call owners central agent Action Boating today. Is your current boat or trailer due for a Service? or in need of repair? dont let it cost you extra money! service or repair it now call now for a booking date. We come to you. Every care is taken when compiling this information; however we take no responsibility as to its accuracy. Prospective Purchasers should satisfy themselves as to the accuracy of this information by their own inspection, or engage a Marine Surveyor. 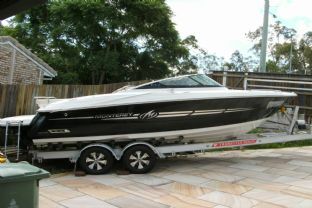 Australian authorized dealer delivered Monterey 234 FSX. With Classic Faceted Styling the 2007 234 FSX is sure to get your pulse racing. Sleek design married with high performance make this model a dream machine. 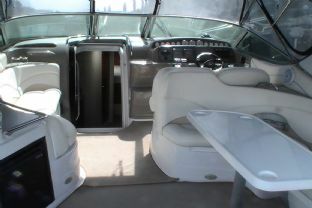 Stainless Steel Pull Up Cleats x 6, Custom Graphics Package, Black Gunnel Molding, Curved Tempered Windshield w/stainless steel Package (Boarding ladder, telescoping & Recessed at Bow and stern ladder), Cockpit table, Custom Upholstery, Premium Kenwood Sirius Satellite Ready AM/FM, CD Player with 2 Amps, 2-Tweeters, 4-speakers, subwoofer, Dash & stern remote, Compass, Depth Sounder with shallow water alarm, Garmin 750S GPS, Premium Steering wheel with Tilt, Dual On/Off Battery Switch, Transom Shower with Pressurized water (Cold only) Extras: 2012 Dual axle alloy trailer, Bow Cover, Cockpit Cover, Cockpit Carpet, Quick & Quiet Exhaust System, Fire Extinguishing System. Every care is taken when compiling this information; however we take no responsibility as to its accuracy. Prospective Purchasers should satisfy themselves as to the accuracy of this information by their own inspection, or engage a Marine Surveyor. 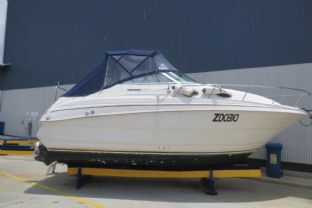 This Mustang 38 is in very good condition and has had extensive service work carried out in the last eighteen months all receipts and invoices available. This large volume vessel has all new covers and clears has been detailed has Genset and aircon, new Fridge, Toilet System, TV/ DVD, Microwave, GPS(new) and more please contact Action Boating the owners central agent for further information and inspection. MUSTANG 2800 SPORTSCRUISER. Single tone white gelcoat and stainless steel fixtures makes this 2800 MUSTANG stand out from the crowd. With good carpets and clears the social cockpit is the ideal entertainment platform, featuring a removable table, comfortable lounges and wet bar with fresh water. Downstairs is surprisingly roomy with a convertible forward V berth / dinette and midship cabin with double. The fully equipped galley includes a deep bowl sink, fridge/freezer, microwave and loads of storage space. The enclosed head compartment has an electric flushing toilet, basin and hot / cold shower. This vessel is powered by a Mercruiser 5.0 LITRE V8 260 HP STERNDRIVE. 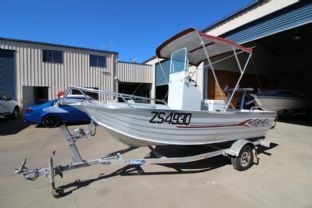 An aft stainless steel rail is equipped on this vessel as is a tender with Honda outboard and it is WELL WORTH A LOOK!! Call Action Boating Today!! (07) 5564 1995 Is your current boat or trailer due for a Service? or in need of repair? dont let it cost you extra money! service or repair it now call now for a booking date. We come to you. Every care is taken when compiling this information; however we take no responsibility as to its accuracy. Prospective Purchasers should satisfy themselves as to the accuracy of this information by their own inspection, or engage a Marine Surveyor. 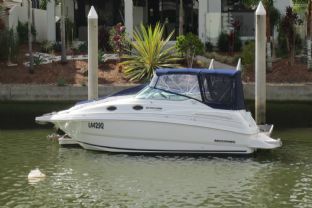 This 2001 model Mustang 3400 Wide Body Sports Cruiser with twin 260HP 5.7L EFI Mercruiser's is in turn key condition and has had an extensive refit to make this 3400 the best we have seen. A big volume well equipped family sportscruiser that has all the features to get you away for extended periods or a weekend away with all the mod cons. It has sleeping accommodation for 5 in a double fwd, a mid cabin double and a single convertible lounge. The cabin is air conditioned and has a Westerbeke genset for offshore 240 volt power. The cockpit is huge and has a teak style cockpit floor the upper cockpit has a lounge and table for entertaining. There is a Furuno sounder, radio, microwave, cockpit fridge as well as one in the galley. A stainless steel BBQ with rear stainless rail is only one of the options on this boat. 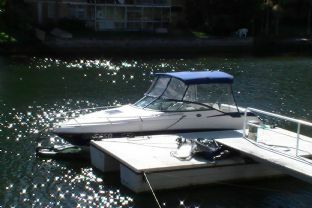 Other upgrades to this fine vessel include Engines and drives removed for rebuilding of the transom shields, Drives thoroughly inspected and serviced as required, New bellows, Engine sumps cleaned and painted, New fuel coolers, New starter motors, New exhaust risers and manifolds, New leg and trim tab motors, New batteries and charger, New inverter - Victron Energy 2000w, New hotwater system, New Westerbeke fuel injected genset with gas water separator exhaust system, Air-conditioning, Aqualuma blue underwater lights, illuminated signage on transom, Blue courtesy lights in cockpit and New fusion audio system (inc. 6 x speakers, bass and amp. Blue LED cockpit speakers x 4), New 32" Smart TV in cockpit, New TV / DVD flatscreen below, New carpet and mattresses, New BBQ, tender motor and breezeway covers, New hydraulic steering to helm replacing cable arrangement, New bimini, clears and euro awning, New tender inc. 6hp Mercury outboard (low hours), New Breville combi oven, New stainless steel 240v AC - 15amp BBQ, New 12vDC compressor and cooling plate fitted to cockpit icebox and New forward helm polycarbonate windows replaced. All through hull fittings and valving renewed, Sani-loo blackwater system serviced, Anti-foul/Prop-speed renewed 2 months ago with sterndrives removed for inspection and new anodes fitted, New bilge pumps, floatswitches with audible alarms fitted, New anchor winch gearbox Just to name a few! 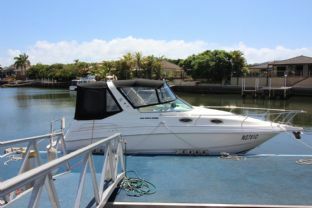 Please call the owners agent Action Boating 07 5564 1995. Is your current boat or trailer due for a Service? or in need of repair? dont let it cost you extra money! service or repair it now call now for a booking date. We come to you. 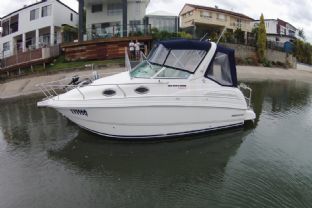 Action Boating lists all details of this vessel in good faith as provided by the owner, but cannot GUARANTEE or WARRANT the accuracy of this information or the condition of the vessel. Inventory inclusions are subject to change or deletion without notice prior to sale. We recommend that purchasers employ an independent marine surveyor & mechanic to determine the fitness and suitability for the boats intended usage. WOW!! This IMMACULATE 2004 MUSTANG 2800 SPORTSCRUISER has just been detailed and had new front clears. This vessel is loaded with features, including a stainless steel aft rail with tender and outboard. full bimini covers and clears and even a BBQ. The social cockpit features an aft lounge a wet bar with deep sink and storage and a forward L shape sun lounge. The comfortable helm seat overlooks a beautiful helm display including mustang gauges and a separate sounder and GPS. Downstairs the saloon is luxuriously equipped with a convertible dinette or forward V berth. A fully equipped galley can be found to port with a fridge/freezer, deep bowl sink, single burner cooktop, microwave and loads of storage space. The midship cabin can comfortably accommodate another two and has plenty of head height. An enclosed head compartment has an electric flush toilet, hot /cold shower and basin. 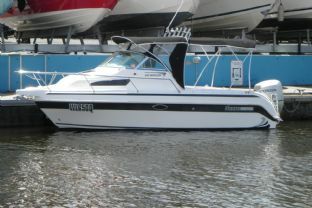 This vessel is powered by a VOLVO PENTA 5.7 Gi V8 STERNDRIVE with DUO PROPS and ONLY 308 HOURS. Call Action Boating Today!! (07) 5564 1995. Every care is taken when compiling this information; however we take no responsibility as to its accuracy. Prospective Purchasers should satisfy themselves as to the accuracy of this information by their own inspection, or engage a Marine Surveyor. 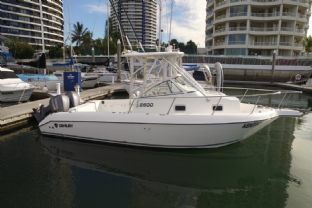 Great Value: 2001 MUSTANG 2800 Sportscruiser JUST ANTIFOULED and READY FOR SALE!!! Featuring a social cockpit with collapsable rear seat, sun lounge and even a wet bar. The adjustable helms seat overlooks a beautiful gauge cluster and EAGLE FISH FINDER. Downstairs the galley boast volume with a convertible forward V berth for two and comfortable midship cabin for another two. The galley is equipped with a 12 VOLT NORCOLD FRIDGE, 240 VOLT MICROWAVE, deep dish sink and plenty of storage. This awesome vessel has full bimini covers and clears, stainless steel duck board rails and electric anchor winch. CALL ACTION BOATING TODAY!!! 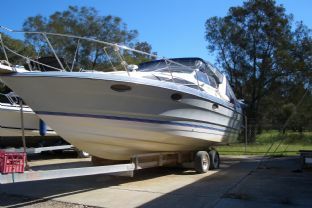 (07) 5564 1995 Is your current boat or trailer due for a Service? or in need of repair? dont let it cost you extra money! service or repair it now call now for a booking date. We come to you. Every care is taken when compiling this information; however we take no responsibility as to its accuracy. Prospective Purchasers should satisfy themselves as to the accuracy of this information by their own inspection, or engage a Marine Surveyor. NOW REDUCED 2004 model one owner Mustang 2400 Clubsport. 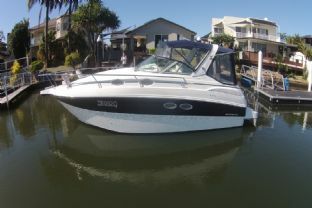 This is a great boat and has been looked after by the same owner since new. 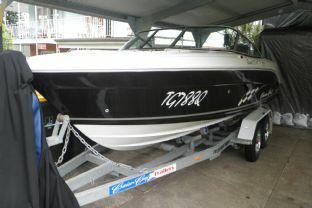 Powered by a Mercruiser 5.0 MPI 260HP V8 done a low 302 hours. The boat has a digital in dash sounder, marine stereo, Power anchor winch, near NEW dual batteries with shore power, Inverter, Trim tabs and near new clears, bimini and canvas. Galley with Pressure hot & cold water, 12/240 fridge, microwave, great bench space and plenty of storage, electric toilet & shower in enclosed head and overnight accomodation for four. There is a wide a swim platform and boarding ladder. 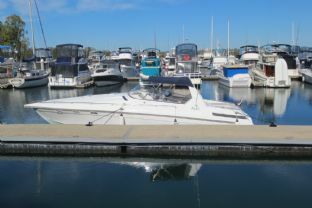 This is an excellent example of this popular sports cruiser in great condition. 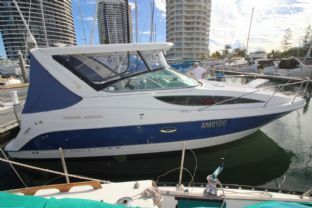 Call owners agent Action Boating today 07 5564 1995. Is your current boat or trailer due for a Service? or in need of repair? dont let it cost you extra money! service or repair it now call now for a booking date. We come to you. Every care is taken when compiling this information; however we take no responsibility as to its accuracy. Prospective Purchasers should satisfy themselves as to the accuracy of this information by their own inspection, or engage a Marine Surveyor. HUGE PRICE REDUCTION!!! 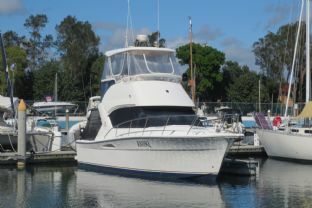 This 1990 model INCREDIBLY TIDY 40 FOOT NUSTAR with TWIN DIESEL SHAFTDRIVES is equally fantastic for weekend getaways or even as a live-aboard. This HUGE VOLUME catamaran features a massive kitchen with 12V stand up fridge / freezer, deep dish sink, loads of bench room and storage, microwave, double burner gas cooktop and gas oven. The comfortable dinette looks onto a huge lounge room with flat screen TV that adjoins a separate heads and laundry. The master bedroom has a Queen bed, wardrobe and additional flat screen TV. While the second midship bedroom features a double / singe bunk arrangement. An additional large heads is also positioned midship. The HUGE flybridge has a tender cradle and electric crane that facilitates the QUINTREX 385 EXPLORER with YAMAHA 25HP OUTBOARD. Bench seating on the flybridge offer additional storage while a individual pedestool helm seat that overlooks the COLOUR LAWRANCE GPS and SOUNDER. Why buy NEW when you can have a 2017 model Powercat Partycat for immediate delivery. Entertaining family and friends? It's a breeze with Party Cat's fully equipped galley,including a 12 volt fridge, deep bowl sink, plenty of bench space and lots of under counter storage. Feel like exploring? the large bow platform with it's wide boarding ladder and grab rails allows easy access to the beach. Want to stay overnight? Use the full length lounge fwd and the aft lounge for a comfy sleep. Having a change room with full head room and a basin, mirror and electric toilet is a real luxury on a 24 ft boat. 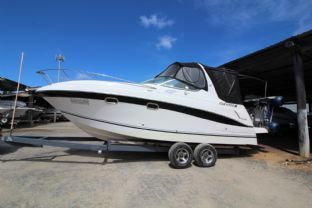 All this and 20 plus knots cruising performance and legendary Powercat sea handling make this the ultimate Gold Coast boat. Call owners central agent Action Boating today on 07 5564 1995 Every care is taken when compiling this information; however we take no responsibility as to its accuracy. Prospective Purchasers should satisfy themselves as to the accuracy of this information by their own inspection, or engage a Marine Surveyor. Entertaining family and friends? 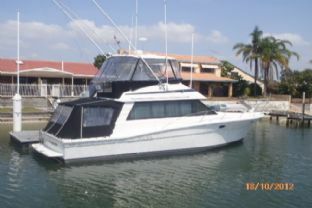 It's a breeze with Party Cat's fully equipped galley,including a 3 burner gas cooktop, 12/240 fridge, deep bowl sink, plenty of bench space and lots of under counter storage. Feel like exploring? the large bow platform with it's wide boarding ladder and grab rails allows easy access to the beach. Want to stay overnight? Use the full length lounge fwd and the aft lounge for a comfy sleep. Having a change room with full head room and a basin and mirror is a real luxury on a 24 ft boat. 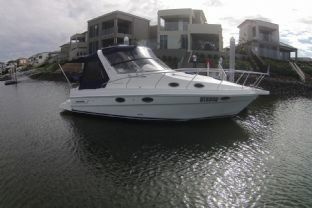 All this and 20 plus knots performance make this the ultimate Gold Coast pontoon boat. Call Action Boating 07 5564 1995 Party pontoon, pontoon boat, cruising. Every care is taken when compiling this information; however we take no responsibility as to its accuracy. Prospective Purchasers should satisfy themselves as to the accuracy of this information by their own inspection, or engage a Marine Surveyor. The ergonomically designed control station is more akin to a car than a boat, with room to stretch your legs out comfortably under the curved touch screen technology dashboard, and excellent visibility due to the close proximity to the toughened glass screen. Visibility is a key feature with superb 360º views available to all seats both in the saloon & cockpit areas. Shade covers clip easily onto the cabin exterior, keeping the interior cool and providing privacy from the outside when required. Carefully designed to provide maximum use of space, the Prowler NZ 10.4’s standard layout offers 2 double staterooms both of which have ensuites fitted with deluxe electric toilet, holding tank, shower, fully mirrored vanity and basin. The staterooms have an additional single berth, necessary for times when extra separate berths are required, or for storing kit bags on weekend trips. The U shaped galley has a 4 burner gas hob, grill & oven, ample bench space, sink, and gas-electric under bench fridge-freezer. All hot water is provided by gas califont, giving instant pressure hot water throughout the boat. The hot & cold cockpit shower is conveniently located adjacent to the 2 angled steps which lead down to the twin boarding platforms with their fold down telescopic ladders making boarding the Prowler NZ 10.4 easy, whether from the dock, dinghy, or water. The custom davits make launching and retrieving the RIB simplicity itself and fold neatly up out of the way when not in use, clearing this area for when you are hauling them in at your favourite fishing spot. When partially or fully enclosed by the clears, which when necessary keep the elements and cold night air at bay, the large cockpit becomes an extension of the saloon, creating a huge lounge/dining area ideal for entertaining or relaxing, with generous floor area, barbeque, sink and three separate seating areas. The clears roll up neatly under the generous roof overhang, transforming it into a large open cockpit, with the seating positioned to maximise comfort, view and convenience, whether underway, fishing or lounging at anchor just off a sandy beach, a pastime made possible by the Prowler NZ 10.4’s super shallow draft and outboards which lift completely clear of the water.Now in production the Prowler NZ 10.4 is constructed from modern composite materials with a durable gelcoat finish designed to provide years of economical low maintenance enjoyment. 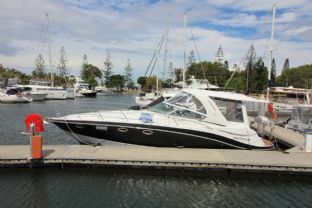 ***PRICE REDUCTION***1985 Randell 34 Flybridge powered by twin Volvo Penta AQAD 40B 165 HP Diesels that have been serviced in February 2014. Vessel is equipped with Shore power, six batteries, marine radio, GPS unit, Depth Sounder, Compass, Marine Stereo, Flatscreen TV/DVD and power anchor winch. Auxiliary power provided by 2 solar panels. Galley has a fridge, stove and oven. Enclosed head comes complete with Shower and toilet. 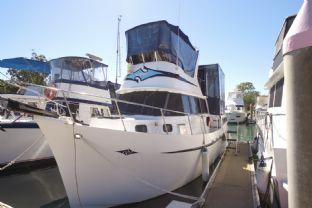 Flybridge has a Bimini and Clears and the cockpit has a Sun awning and camper covers, Accommodation is by way of a Large double berth fwd and Dining converts to 3 single beds, She carries 1,000 litres of diesel fuel and 400 litres of fresh water. Is your current boat or trailer due for a Service? or in need of repair? dont let it cost you extra money! service or repair it now call now for a booking date. We come to you. Every care is taken when compiling this information; however we take no responsibility as to its accuracy. Prospective Purchasers should satisfy themselves as to the accuracy of this information by their own inspection, or engage a Marine Surveyor. 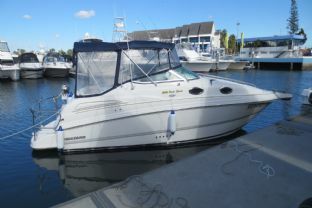 NOW REDUCED This 2007 model 230 Rinker Atlantic Cuddy is designed with a day boat cockpit and overnighter's cabin. Powered by a Mercruiser 260 hp sterndrive with only 360 hours she boasts a glare resistant helm, sports steering wheel, LED display, illuminated rocker switches, GPS, depthsounder and dash mounted compass. The innovative stain resistant carpets and fabrics along with mildew and odor resistant cushions, dinette table, solid surface Corian countertops, pressurised freshwater sink, integrated rubbish container and screened deck hatch provide a pleasant boating experience. This vessel boasts abundant storage and essential functionality. 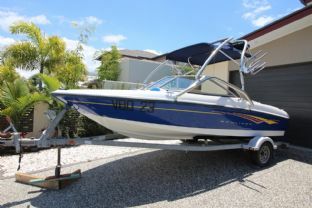 Call owners central agent Action Boating Today 5564 1995 Every care is taken when compiling this information; however we take no responsibility as to its accuracy. Prospective Purchasers should satisfy themselves as to the accuracy of this information by their own inspection, or engage a Marine Surveyor. 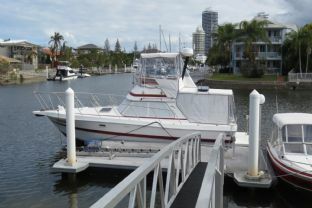 Powered by economical 250hp Cummins Diesels which have had major servicing, new exhaust systems, high performance 4 blade propellors fitted and has just been antifouled and detailed with new flybridge clears and outdoor carpet. Owner wants vessel sold has stopped using due to off shore business commitments. Every care is taken when compiling this information; however we take no responsibility as to its accuracy. Prospective Purchasers should satisfy themselves as to the accuracy of this information by their own inspection, or engage a Marine Surveyor. Runaway Bay Pontoon Boat Tri Hull. Whether you enjoy fishing or entertaining your friends with room to move. 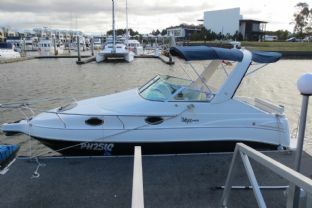 This boat is ideal for the Broadwater boating or island hopping with drinks afloat. These pontoons are easy to drive, great fun and are a favourite with families. 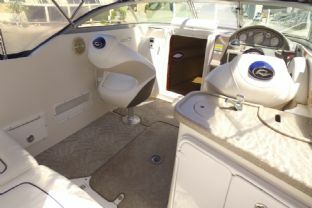 Comfortable console helm station with electronics and stereo and plenty of seating for everyone. All colour coordinated double biminis, covers and clears are bespoke. The outboard fitted is a Suzuki 115HP 4 Stroke done low hours. Is your current boat or trailer due for a Service? or in need of repair? dont let it cost you extra money! service or repair it now call now for a booking date. We come to you. Every care is taken when compiling this information; however we take no responsibility as to its accuracy. Prospective Purchasers should satisfy themselves as to the accuracy of this information by their own inspection, or engage a Marine Surveyor. 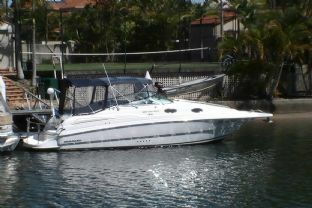 2004 SEA RAY 245 SUNDANCER SPORTS CRUISER. This boat has never been anti fouled and is powered by a Freshwater cooled Mercruiser 5.0 MPI 260HP V8 that has just had a service in January and is equipped with Smartcraft gauges and LOW HOURS!! Great performance with exceptional internal room for its size. The saloon features a large mid ship cabin double and convertible V berth forward. 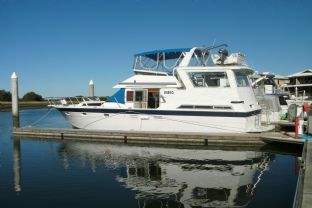 The fully equipped galley includes a stove, fridge, and a suprising amount of storage space. The class leading cockpit design with social layout featuring a removable aft table, comfortable aft bench, double port seats and a comfortable helm position ovelooking an good electronics including a Navman GPS. What a great weekender. 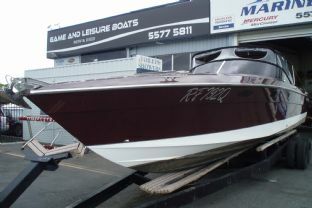 Owner says sell, call Action Boating on (07) 5564 1995. An air berth to suit is also available. Is your current boat or trailer due for a Service? or in need of repair? dont let it cost you extra money! service or repair it now call now for a booking date. We come to you. Every care is taken when compiling this information; however we take no responsibility as to its accuracy. Prospective Purchasers should satisfy themselves as to the accuracy of this information by their own inspection, or engage a Marine Surveyor. 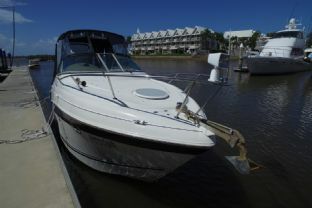 This 250 Sundancer comes with its own airdock and has recently been repowered with a new Mercruiser 496 fresh water cooled multi point injected engine with low hrs. Has accommodation for four with enclosed shower and toilet and is a great weekender with full camper covers, call Action Boating 07 5564 1995. 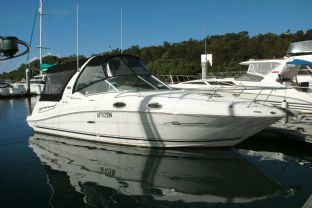 The 2006 Model Sea Ray 275 is an excellent family orientated express cruiser in the popular 26 to 30 size range. She's small enough for one person to handle easily and keep the budget in check, but large enough for the whole family to stay overnight in relative comfort. Plus, she also has a fair amount of grunt to add a bit of spice to those weekends away with a Mercruiser 350 MAG 300 HP V8. New risers and manifolds were installed in Oct 2013 as well as a full service and anitfoul. This vessel is ready to go cruising. Call owners central agent Action Boating today 07 5564 1995 Is your current boat or trailer due for a Service? or in need of repair? dont let it cost you extra money! service or repair it now call now for a booking date. We come to you. Every care is taken when compiling this information; however we take no responsibility as to its accuracy. Prospective Purchasers should satisfy themselves as to the accuracy of this information by their own inspection, or engage a Marine Surveyor. 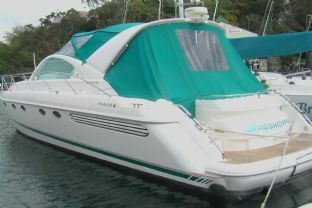 2006 Sunrunner 3300. 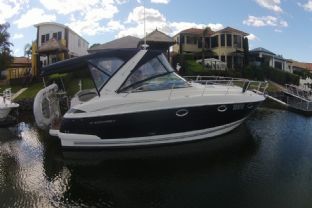 A great family boat, with plenty of style and comfort to suit everyone. 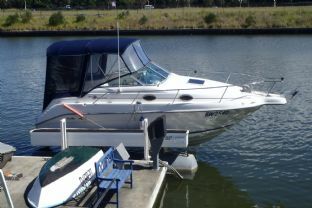 Powered by twin5.0 MPI 260 HP V8 Mercruisers, with Bravo II drives that have been recently serviced and new props just fitted. The vessel sleeps 4 people in a double berth fwd and a mid cabin double. The enclosed head features hot and cold shower and Lectrasan toilet. 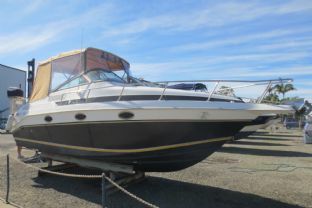 Features include fridge, new stereo, TV with DVD, new batteries and new battery charger, electric winch with new anchor and new chain, Bow thruster and teak rear deck. 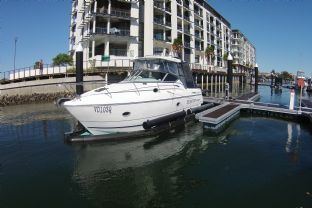 Vessel has an excellent serivce history and is ready for Summer. Call Action Boating today on 07 5564 1995. Is your current boat or trailer due for a Service? or in need of repair? dont let it cost you extra money! service or repair it now call now for a booking date. We come to you. Every care is taken when compiling this information; however we take no responsibility as to its accuracy. Prospective Purchasers should satisfy themselves as to the accuracy of this information by their own inspection, or engage a Marine Surveyor. Providing unlimited open-air fun and sumptuous accommodation, the Manhattan 66 sets the standard for high-level entertainment, putting the emphasis on fun and excitement in Sunseeker's inimitable style. Effortlessly blending luxury with practicality, the Manhattan 66 has a broad beam, graceful profile and extended cruising capabilities. En suite accommodation for eight and self-contained aft crew quarters make the Manhattan 66 a highly versatile vessel. Included in this fantastic vessel is the following. Air conditioning: 6 separate reverse cycle units 7,000 + 10,000 + 12,000 + 3 x 16,000 BTU Water heating: Bow thruster: Stern thruster: Trim tabs: Underwater lighting: Fuel conditioning: Water purifier: Tankage Fuel: Fresh water: Black water tank: Electric boiler: Performance 30 knots 22-24 knots 2 x 900 HP MAN - V8 - D2848-LE423 750 500IV 1 x Kohler 19kw @ 50 hertz 1600 Lewmar hydraulic 10.7hp – 24V Lewmar hydraulic 10.7hp – 24V Hydraulic 4 x halogen 24V fitted at the stern Diesel fuelmag conditioning system Water purifier for cold water supply 240 litres per hour @ 22 knots 290 nautical miles Navigation Equipment GPS: Furuno Chartplotter: Autopilot: Simrad Radio: Depth sounder: Electronic speedlog: Radar: Search light: Compass: Ritchie 220 Volt AC – 12-24 Volt DC 1 x Newmar 24V - 95 amp 1 x Newmar 12V - 14 amp 6 engine, 4 domestic and 2 generator batteries Optional glendinning cablemaster recovery system Furuno Navnet 10’4” colour LCD plotter AP25 Simrad AHS82 VHF Simrad IS15 Simrad IS15 Furuno 4 foot open scanner Shanshin twin beam with remote control HF73 Duplicate engine controls and instrumentations on flybridge helm station Deck Equipment Anchor: Chain: Anchor winch: Deck wash: Swim Platform: Passerelle: Besenzoni Liferafts: Flybridge Wet Bar: Bimini Top: Stern captans: Sunbathing cushions: Underwater lights: Domestic Appliances o Bosch refrigerator & freezer KTR18420 240v in Galley o Microwave grill/oven Panasonic in Galley o Dishwasher Bosch DRV 4603GB in Galley o Electric ceramic hob in Galley o Washer-dryer Bosh fitted in crew cabin o Bosh freezer fitted in crew cabin o 2 brick digital safe fitted in master cabin Lewmar 40kg Delta 90m of 10mm diameter Lewmar V4 GD-24V Fresh water deck wash with outlets fwd & aft Hydraulic hydraulic telescopic with teak grating – 3.9m 2 x 8 man canister Lifeguard on flybridge Including sink, electric cool box, ice maker, Gaggenau grill & storage Stainless steel frame with navy blue canvas 2 stern captans with foot control – Lewmar – 24V Large sunbathing area on the foredeck and flybridge 4 x underwater lights halogen 24V fitted at the stern Entertainment equipment o Tracvision G6 satellite TV receiver fitted in white dome o Sharp 26’’ flat screen lcd TV in saloon on rise & fall system o Sharp 15’’ flat screen lcd TV in all cabins o Humax satellite TV decoders in all cabins and saloon o Bose Lifestyle 38 DVD/CD surround system in saloon o Alpine DVD/CD/Radio player fitted in Master cabin o Alpine CD/Radio player in saloon with outside speakers Covers o Black mesh windscreen covers o White Tender cover o Rear cockpit Navy blue camper covers with transparent windows o Flybridge instruments cover Accommodation Guests: “Laura Star” accommodates up to 8 guests in 4 cabins. With an ensuite forward VIP cabin, twin ca bin to starboard, twin bunk cabin to port and a full beam midship master cabin with ensuite facilities, this b oats really offers its owner style, space and comfort. Upon entry to the saloon, the spacious starboard side galley makes entertaining easy, maintaining a strong social atmosphere throughout. The saloon provides ample space to dine or relax, with the choice to make full use of the vessel’s entertainment system. The flybridge is very spacious and offers all guests aboard a taste of the al fresco lifestyle with its wetbar. Crew:	There is a crew accommodation for	two crew members positioned aft of the engine room via a separate door in the transom. T here are two single berths adjoining a shower room and toilet. Interior Finish The interior of the yacht is finished predominantly in cherrywood with a high gloss finish complimented by beige carpets and cream leather sofas. The deckheads are covered in ‘Novasuede’ with white Vinyl in the shower rooms. All electrical fittings are European AC sockets finished in chrome. 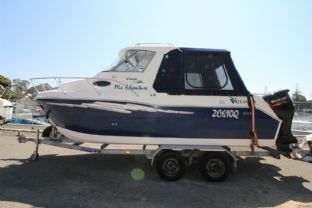 Tenders and Toys -	Avon Jet Tender Seasport 3.20 with Yamaha engine 2006 – 4 persons Comments It is a 4 cabin version. “Laura Star” is a beautiful example with an extensive inventory. A viewing is highly recommended. Every care is taken when compiling this information; however we take no responsibility as to its accuracy. Prospective Purchasers should satisfy themselves as to the accuracy of this information by their own inspection, or engage a Marine Surveyor.